Jirō-kun no Daibōken is an action/platform/puzzle game by Natsume. 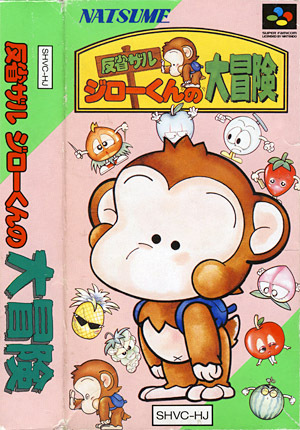 The game starts as Jirō-kun (aka Spanky), a cute little monkey, is on a day trip for a refreshing gourmet picnic. But suddenly, in the middle of a peaceful forest, a witch appears, imprisons the poor Jirō and steals all the fruits he was carrying in his backpack. And she has even more sinister plans in store for the small primate and decides to use her powers to turn all these fruits into evil monsters, forcing Jirō to use all his wits to escape his dogged pursuers and return home safely. The aim of each level is to help Jirō locate the exit door in order to move on to the next stage. However, multiple large locks (one to a maximum of six) keep it firmly shut, and the monkey must collect all the keys scattered around each level before seizing a chance to escape. Carrying out that task would be easy, if only it weren't for the legions of enemies populating the screen. And to defend himself against these critters, Jirō only comes equipped with possibly the world's most unusual weapon - bubbles. However, these blue bubbles come with a bit of a twist - if the player presses the action button again, the bubble pops and releases a small baseball ball, enough to strike one enemy down. And that's not even half of it! Jirō can bounce the blue bubble on his head to power it up (from Green, Yellow to Red) and these new bubbles release even more devastating attacks, such as lines of soccer balls, spinning volley balls and rows of basket balls! And the bubbles have a lot more to offer - as such, they can stun enemies for a while or capture keys or items that Jirō wouldn't be able to reach otherwise. And the game has a lot of items to collect, such as coins (points), Extra lives and hats. The latter come in a multitude of forms, from a Baseball Cap (helps Jirō in controlling the bubbles), Gold Crown (prevents Jirō to be affected by special platforms, such as icy surfaces), Top Hat (gives Jirō the ability to instantly grow a red bubble! ), Straw Hat (Jirō can glide in the air after a jump) and Spiked Helmet (temporary armor against enemies). And Jirō must always be on his toes, because enemies can also collect items (including keys) and he will have to battle the foes if they happen to do so! Additionally, the game is filled with many special and rewarding features, such as switches (activates traps, such as Fiery Birds or Fireballs that both Jirō or enemies can operate), Cannons (throw Jirō and enemies in the air) or hidden Gold Doors (lead to bonus stages). Jirō-kun no Daibōken consists of five large areas of ten levels each, all punctuated by a requisite boss battle. Each zone also features a three-digit password system to save the player's progress. Interestingly, Jirō-kun no Daibōken was first released in 1991 as a Game Boy game (picture on the left) called Lucky Monkey in Japan (and Spanky's Quest in the rest of the world). 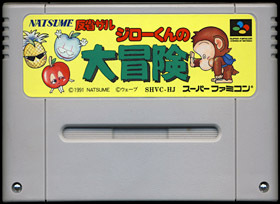 However, although the game is similar to the Super Famicom version tested here (they do share the same theme), both games have notable differences - the levels as well as some of the enemies and bosses are slightly different, and the game doesn't require the player to collect keys, but to clear each level of its enemies instead. Finally, the way to pop the bubbles is different - the player has to press and hold up to burst a bubble, making the game slightly more difficult to play. 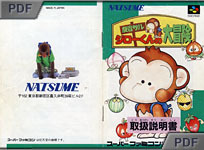 The game also features letters to collect in order to access the bonus stages (the letters spell 'MONKEY' in the Japanese version and 'SPANKY' in the western port). Finally, Lucky Monkey doesn't seem to feature power hats nor sport balls, and bubbles split instead into black balls. Wicked witch turns fruits into monsters, Mopoland Population famished! Welcome to Mopoland, where the evil witch Morticia has cast an evil spell and turned all the fruits of the mighty kingdom into fiendish monsters. Spanky, our primate hero is on a quest. Armed with his magic ball, and his exceptional ball heading capabilities, Spanky must hunt down Morticia through six gruelling levels to liberate Mopoland, and save it's citizens from a certain famine. Jirō-kun no Daibōken is really a game that took me by surprise - and a really pleasant surprise that was. I personally love the cute and extremely polished graphics - Jirō looks great with an ever-present attention to detail. The same applies to enemies, and although there are only a handful of them in the whole game, they are all full of life and really fun overall. The catchy music is also excellent and fits the mood of the game very well. But it's in the gameplay department that Jirō-kun no Daibōken really shines - bubbles take a bit of time to get used to, but when you do, you will be breezing through the levels and evading enemies with ease. The game is a very fun ride from beginning to end and it definitively has that familiar 'just one more level' thing going for it. I was incredibly surprised by the depth of the gameplay - for instance, bubbles can be used to kill enemies but they can also fetch items that are hard to reach, or reveal bonus stages! And as the game progresses, you discover new unique ideas (such as switches that activate traps, cannons or conveyor belts) that manage to keep the gameplay fresh. All in all, Jirō-kun no Daibōken is absolutely delightful and fun, and is definitively an overlooked game that deserves more merit than it has.